Lou Loves Beauty: Black Toothpaste. Say whaaat?? 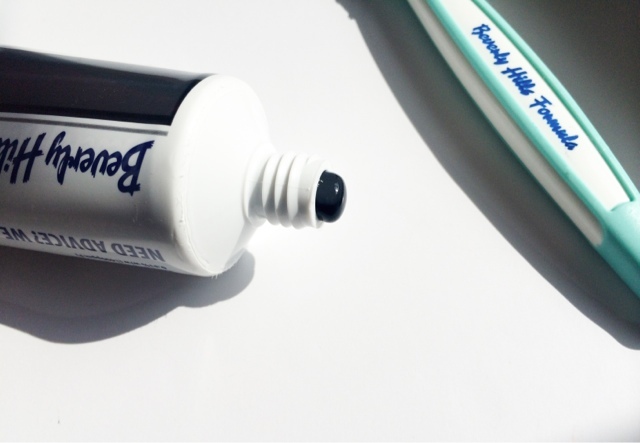 So this may be the strangest thing I've reviewed on my blog, Black Toothpaste! 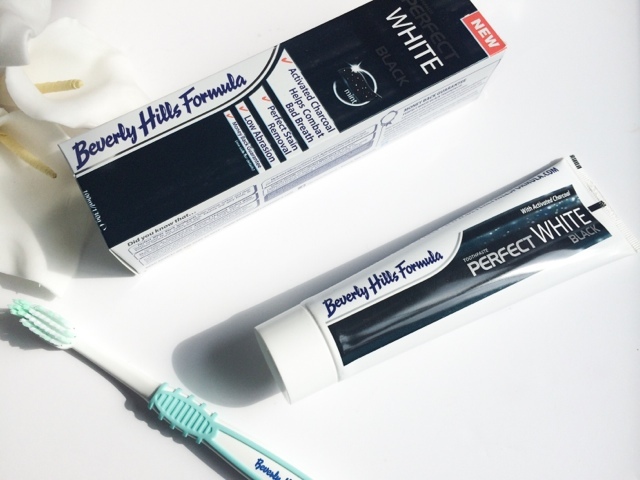 If it was from any other brand I would have thought it was a joke, but Beverly Hills Formula are well known and trusted by many, so my initial fear of being left with black stained teeth was quickly resolved. The black colouring stems from the activated charcoal ingredient which is well known for targeting tannins, a main compound found in tea, coffee, wine and spices, all of which are a main cause of staining. The charcoal removes the tannins from the surface of the teeth without harming the enamel, which some harsh whiting toothpastes can do. The charcoal also tackles bad breath and neutralises bacteria, and the sodium Fluoride helps keep teeth strong and healthy - meaning it's safe to use daily to clean teeth and achieve a whiter smile. Once I got over the initial colour the toothpaste tasted very minty and instantly left my month feeling really fresh and clean. My husband and I normally use a whitening toothpaste so to be honest I wasn't expecting to see a dramatic difference in the whiteness of my teeth. But it did a great job at removing stains, and my teeth felt really clean, I mean really clean. The black paste transforms into a slight grey, off white foam, so just like any other toothpaste. I really do notice a difference after using it. But don't get me wrong, you're not going to end up with a smile similar to Ross from friends did when he had he's teeth whitened! But any coffee connoisseur out there will probably see the difference in the whiteness of their teeth, I know I did! So if you're a coffee addict like me, or partial to a glass of red wine or two, and looking for a more natural, less harmful way to whiten your teeth this could be the tooth paste for you! In a nutshell, Black Toothpaste can really make your teeth white. Who knew?! What are you favourite whitening toothpastes? This is supposed to be really good but I want to try the one with the little led light in the lid!